Please help IASWG, so crucial to the life blood of social group work, to promote ethical and effective social work. Exciting opportunities to implement our mission abound, but they are set into motion only with your support! Founded on democratic ideals, IASWG teaches people all over the world who work with groups, both in social work and outside of the field, a leadership value base and skill set that help people to comfort and support one another, to problem solve in a deep and lasting way, to appreciate their individual strengths and potential, and to deal with differences in a life-enriching way. In short, to groups of all kinds and sizes, the many activities of IASWG teach the kind of leadership that helps people from all walks of life value one another better. Make it $10… or $100… or $1,000. Whatever you can afford, every single dollar helps IASWG to foster ethical and effective work with people. Please recognize this dedication by making as generous a contribution as you can. To make a tax-deductible* donation please click here. Group Work Camp Fund (GCW) - This fund supports student registration fees for attendance at the Group Work Camp. Students then join IASWG to attend the camp and participate in the 3-day long training in experiential group work. The fee covers the students room and board for the weekend. focuses on the advancement of research related to social work with groups. The IASWG General Fund (GF) - IASWG is indebted to its many volunteers, but without operating funds it could not exist. This “bread-and-butter” fund supports the many operating costs including administrative and technological activities that connect it to and serve its membership. The IASWG John and Carol Ramey Endowment Fund (EF) - Created in honor of the Rameys, who served in administrative capacities for the Association’s first 25 years. Their selfless dedication made it possible for IASWG to take root as the world’s central reference point for social group work values, knowledge base, and skill sets. This fund ensures IASWG’s future. The IASWG Martin Birnbaum Special Projects Fund (MB) - Donations will be used to provide funding support for IASWG chapters seeking to produce a special project, as well as for any IASWG event such as an IASWG Group Work Camp being held globally. 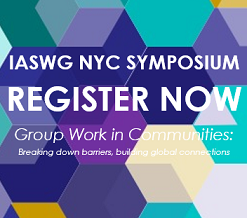 The IASWG Roselle Kurland Training & Education Fund (KF) - IASWG is the premier training and education venue in the world for social group work. This fund supports projects that target training and education in social group work knowledge, skills, and values. The IASWG Robert Salmon Organizational Development Fund (SF) - This fund helps IASWG to take advantage of all available technology – human and mechanical – that will advance, highlight, and promote its mission including marketing, promotion, and coalition building. The IASWG Catherine Papell Symposium Scholarship Fund (PF) - This fund helps practitioners from emerging-economy nations to attend IASWG symposia. Practitioners whose demographic profile meets this criterion and whose proposal for a symposium presentation is accepted are eligible to submit an application, which includes a letter of request. In Honor/Memory - In addition to the above, you may make your contribution in honor or in memory of certain persons who may be, but do not need to be or have been, members of the Association. Contributions in honor of family members, friends, mentors, colleagues, and others of particular sentiment are all welcome. If you would like to make a tax-deductible* donation please click here. *If you reside outside the U.S., please check the rules and regulations that govern your donation.